Hello everyone. While stalking Rotten Tomatoes' page for the release date of The Hunger Games, I chanced upon Red Dawn's trailer... and yay! So now, I can't wait for Thanksgiving 2012 for its screening date. 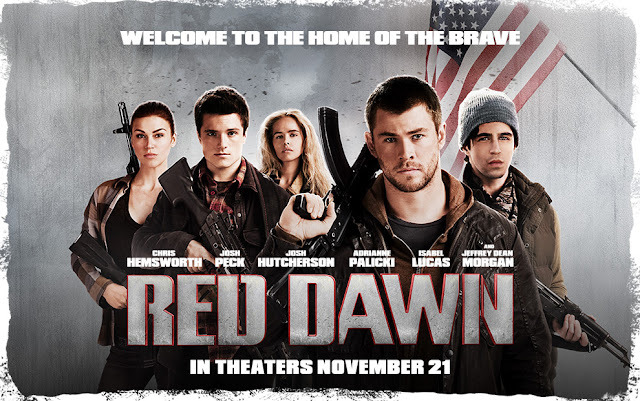 Red Dawn in theaters November 21, 2012. 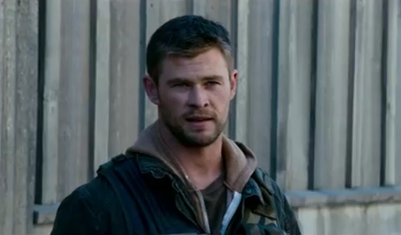 Chris Hemsworth as Jed Eckert (played by Patrick Swayze on the previous film). I Thor-oughly love Chris Hemsworth, and I'm cheering for Peeta Mellark all the way, vs. Chris' younger brother Liam Hemsworth's Gale Hawthorne! #TeamPeeta So yes, this fangirl is all out supporting Red Dawn 2012. Anyhow, fawning aside to my boy loves and crushes, this time, the boys and girls will battle against North Korean invaders. This and that, the over-all plot is interesting enough. ...and the North Koreans attacked! So there you have it, more movies to watch. Photo Credits: Official Movie Poster (Google Image), all the rest are my personal screen captures from the movie preview. Chris looks so much like Liam in the poster! Ive been waiting for The Hunger Games too!